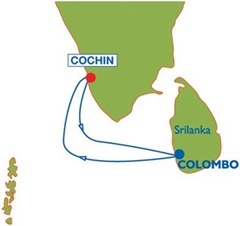 Kochi (Cochin) is now in the world cruise map with the commencement of weekly cruise itineraries from Kochi to Maldives and Colombo. This service is being provided by MV Aquamarine. Around 60,000 Indian tourists are expected to cruise during this season. The service was inaugurated by Kumari Selja, Minister of Housing and Urban Poverty Alleviation and Tourism on December 01 at Kochi. Voyages through MV Aquamarine is available from December 2009 to April 2010. The first voyage from Kochi commenced on December 02 to Maldives. 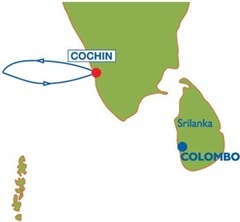 Cochin Port Trust offers host of amenities to cruise vessels like “walk in” berthing, sufficient draft, bunkering services, concessional tariff, a “single window service” for Customs, Immigration and Port Health clearance. 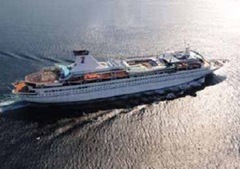 Owned by Louis Cruises India, a subsidiary of Louis Cruises one of the largest cruise operators in the world. Has a capacity to carry 1,200 passengers. Has 525 spacious state rooms and suites, several restaurants, a swimming pool, fitness centre, massage/sauna facilities, casino including duty free shopping facility. The vessel has also been modified to play cricket on the high seas. Food and entertainment on board are also available to suit Indian taste. For more details, log on to Louis Cruises – Cruises from India.